The debate over raising tuition at Concordia, particularly for international students such as myself, fails to acknowledge the various reasons we chose to study in Canada. When I applied to 12 universities at the end of my high school career, I had no idea Concordia University even existed. That all changed in 2016, the day before Thanksgiving, when I had my first seizure. At the time, I had started college in Kalamazoo, Mich. I had chosen to attend that university because of a generous scholarship, but the annual price of $45,000 still took a toll on my parents’s finances. As my seizures grew in intensity, my parents’s budget shrank. They now had to pay for an American education and increasing medical costs. Granted, their insurance handled a portion of the financial burden, but nothing could prepare them for the massive bills to come when I started my second year of college. Two weeks into the academic year, while walking home from a party, I had two massive seizures, each lasting for a dangerously long few minutes. In the aftermath, unbeknownst to me, my mind became overwhelmed with paranoia, delusions and confusion (known as the postictal state). These post-seizure symptoms can manifest in a variety of ways and usually last anywhere from a few seconds to a few weeks. After refusing to be taken to a hospital, aware from previous experiences the ambulance ride would cost $6,000, I became convinced my anticonvulsant drugs were prescribed by a malicious doctor intent on provoking seizures and taking money from the pharmaceutical industry. A year later, I am aware that delusion is absurd, but in the days following the seizures, my mind deteriorated to the point where my behaviour became noticeably concerning. The college chaplin I worked with took me to the medical centre. Following a brief evaluation, I was involuntarily committed to a for-profit neuro-psychiatric facility in nearby Indiana. As each day passed, my postictal state subsided and in its place, I developed a tremendous sense of guilt. 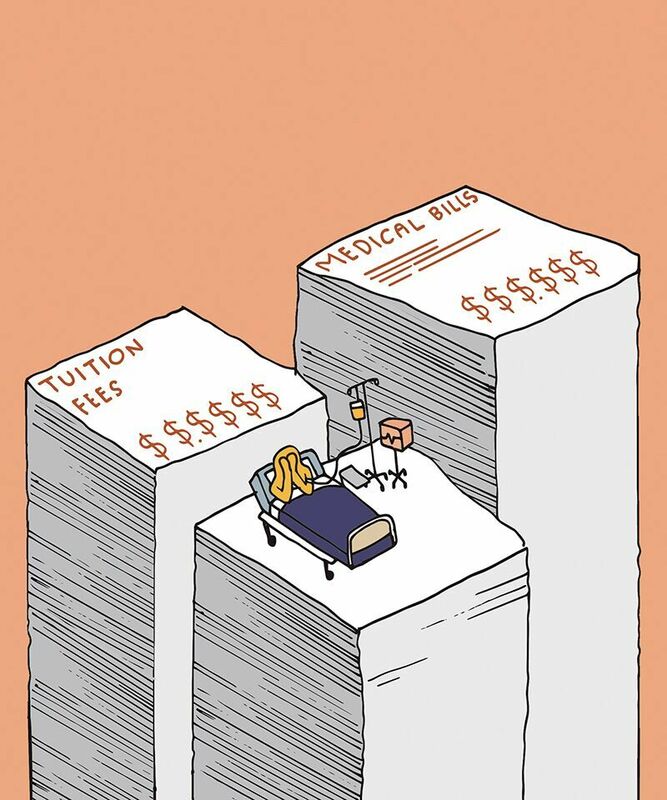 Even with my parents insurance, the hospital, ambulance and tuition would cost my parents tens of thousands of dollars. After a few days, I received a notebook and pen, an incredible privilege at an institution where many mentally impaired individuals have violent tendencies. In the notebook, I wrote down the pros and cons of staying in Michigan, and I ultimately decided that when I got out, I’d apply to Concordia. I knew of the university because, the previous spring, I had visited a friend in Montreal and fell in love with the city. My acceptance letter filled me with mixed emotions; I felt sad to leave my internship and friends behind, but was also excited for the adventure ahead. In January 2018, I started classes at Concordia. Meanwhile, my parents continued paying off the never-ending stream of medical bills. The annual cost of tuition, housing and living expenses in Canada saved my parents over $20,000 a year. Insurance, as part of the university health plan, reduced my monthly medication cost from $260 to $0. According to The Concordian, Concordia president Alan Shepard said the recent tuition increase for international engineering and computer science students matches tuition hikes for non-international students. At first glance, this new financial approach makes sense, but fails to acknowledge the complex circumstances that motivate international students to study at Concordia. Raising international students’ tuition in order to maintain proportionality to what Canadian citizens pay is simplistic, and harms international students with unique circumstances like me. I love Concordia University, and have made a home here. Canada and Quebec’s principle of the right to affordable education and medical care is something the United States desperately needs. Many of my American friends view their northern neighbours’s values with awe. Let’s work to ensure they are preserved so international and domestic students alike can obtain an education and fulfill their dreams. Note: All costs mentioned have been converted from American to Canadian dollars.